Leighton Town’s dream of a day at Wembley came to an end on Saturday as 1874 Northwich progressed to the semi-finals of the FA Vase. 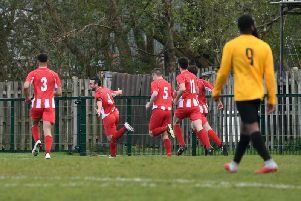 Scott McGowan’s first half penalty was the difference between the sides at a packed Bell Close as the North West Counties League Premier Division booked their spot in the final four, ending Leighton’s run in the competition. “The boys are absolutely gutted,” said Town manager Scott Reynolds afterwards. “They gave everything they had in the second half, and can be very proud of their efforts today. McGowan’s penalty, coming after 25 minutes, could have been insignificant had Town capitalised on their early chances in the game. Dom Marsala sent a shot just wide of the mark as he reached Lea Coulter’s cross, while Alex O’Brien’s quick thinking nearly caught Northwich keeper Greg Hall out, but he managed to tip it over. But the decisive moment, and ultimately the difference between the two sides, would come on 25 minutes. Jake Parker, who earlier had a chance well saved by Town’s Tom Wyant, raced onto a loose ball in the Reds’ penalty area, but a rash challenge from Marsala sent him sprawling, leaving the referee little option but to award the penalty. McGowan stepped up and drilled it low past Wyant’s dive to give the visitors the lead. Reynolds would later say Northwich’s game management was the key in denying Leighton much of a sniff of getting back into the game, but they certainly had chances to get back on level terms, especially in the second half. Forcing the visitors deeper and deeper into their half, Hall was by far the busier of the two keepers, denying James Hatch and substitute Lorrell Smith. Wyant needed to be on his game to keep the score from going beyond Leighton too though, stopping efforts from Sam Hind and Adam Whitlock. There were desperate appeals for a penalty from the home side deep into stoppage time as they pleaded for a handball decision, but it wasn’t to be as Leighton’s Vase run came to an end. Town have little time to dwell on the defeat though as they return to SSML Premier Division action tonight (Tuesday) at home to Tring Athletic - kick off 7.45pm.